Hydraulic kits include all components, instructions and support needed for complete installations of auxiliary hydraulic systems on excavators. Hydraulic kits specifically engineered for most excavator/attachment combinations with special attention given to optimizing attachment performance for the hydraulic flow and pressure supplied by the excavator. Wedgelock quick couplers are designed with operator and site safety in mind. The Wedgelock 'Independent, Initial and Instant Safety System' or 'I-Lock' is the ultimate coupler back-up locking system available globally today. 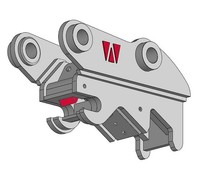 Attachment changes are completed safely and quickly without leaving the cab making the Wedgelock coupler the centerpiece of a multi attachment system.